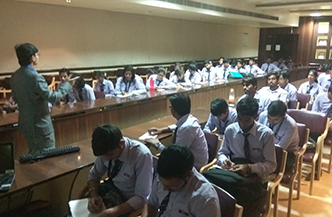 The Department of Training and Placement, RIET, Jaipur has organized a TEQIP-III Sponsored Expert Lecture on “Enhancing Soft Skills” on 14.03.18. Eminent guest speaker who graced the occasion was Ms. Minakshi Harod, Senior Process Associate, TCS, Gurugram. Ms. Minakshi was welcomed by , Dr. Saroj Hiranwal, Principal RIET, Dean Academics & Admin, RIET, Prof. Kapil Dev Sharma, Prof Sachin Sharma, Vice Principal, RIET ans Dr. Monika Shekhawat, Training and Placement Head. 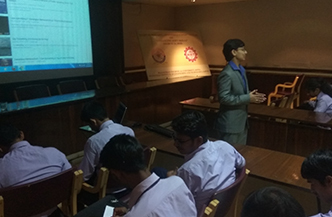 The session was attended by all HODs, students and faculty members of RIET. 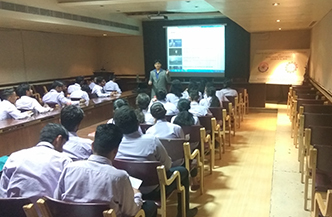 Speaking on the occasion Ms. Minakshi explained that how soft skills plays an important role in today’s era. She also explained that soft skill is a tool by which an individual can grow and improve themselves for better growth. Taking communication as a main base Ms. Minakshi demonstrated the in depth knowledge about communication techniques, do’s and don’ts. She started the session with some ice breaking activity for the participants to understand how to communicate. Then, she explained whole communication environment in the world so, each participant can understand what to listen for, why to listen, when to speak, how to speak, how to start conversation and how to sustain a conversation. She also explained the presentation skill and interaction skills which is to be needed while communicating with someone. In this are she demonstrated what to present, how to present, importance and need to multimedia presentations, its basics, communication styles and how to speak in group to be more effective so that everyone listen to what you say. She also covered some crucial skills like, visual techniques, nonverbal ability, and aural communication techniques. Lastly, she demonstrated how to transform the habit to become fluent speaker and power of subconscious mind in communication. She concluded the lecture by a mesmerizing video and motivated the audience for future endeavor. Dr. Saroj Hiranwal, Principal RIET, said that a person without communication skills is like a room without light, and an arrow without sharpen tip. Dean Academics & Admin, RIET, Prof. Kapil Dev Sharma said that it is equally necessary to build up the communication skills with study and extra activities. He emphasizes on increasing communication skills among an individual. Dr Monika Shekhawat expressed her gratitude to Ms. Minakshi Harod for giving her valuable time and imparting this knowledge. She also added that expert lectures of this kind helps the students and faculty members to remain updated in this field.